Here’s some doings this past week…courtesy of my phone camera. Almost too huge…I can’t find a place to put it. I bought my second roll of Warm and White while it was 50% off at Joanns with a free shipping coupon. It should be enough for one or two quilts I think. ;) My husband was thrilled. 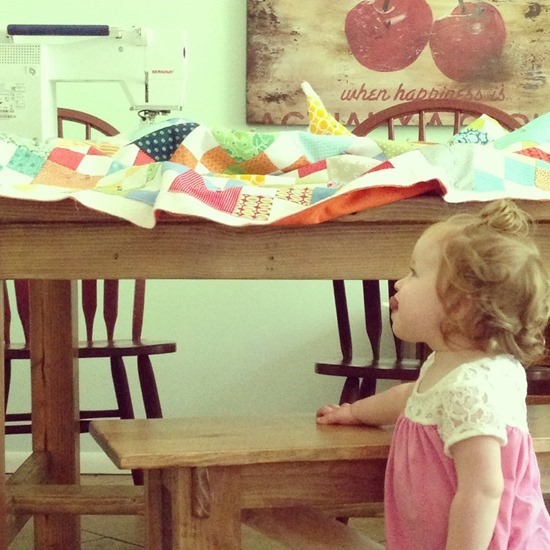 On larger quilts I do the quilting on the dining table …Sophie loves to watch…and pull the quilt down. 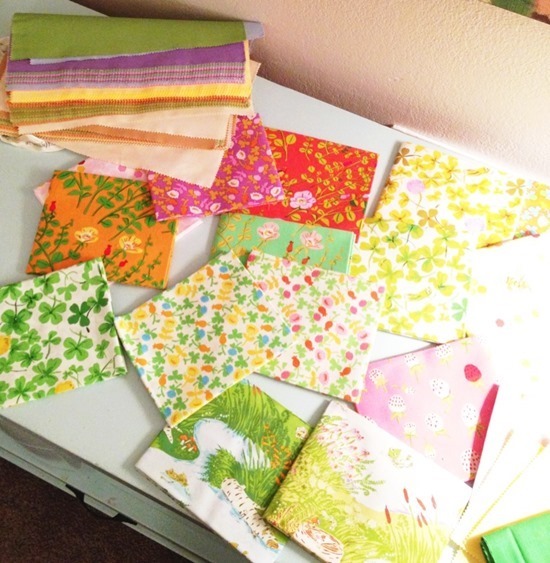 I finished cutting up my Briar Rose bundle last night. I stayed up way too late…and my kids woke up way too early (yawn). he he I get the batting like that too and wait for a discount and then free shipping coupon! 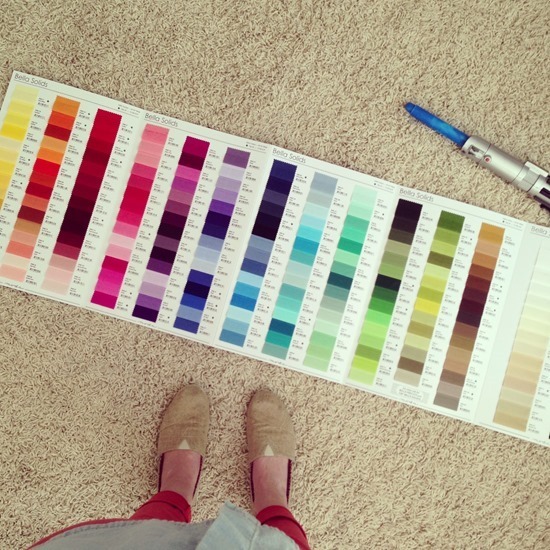 I have a color card like that too I hung it on my wall vertically though, but it's SEW pretty to look at. So you do actually have chickens! :-) I've always wondered. We had 9 lovely months with 3 chickens before we had to move. I loved those things. A lot noisier than I expected though even without a rooster. Can't wait to see what you do with your Briar Rose. ok, 1. I don't know HOW I was not following you on IG, but now I am. 2. I always want to buy a roll of batting, that is awesome! 3. I am DROOLING over your Briar Rose bundle. Lucky you!!!! I also, wanted to buy large roll of batting. I also have chickens, enjoy my girls. I want a roll of batting like that. 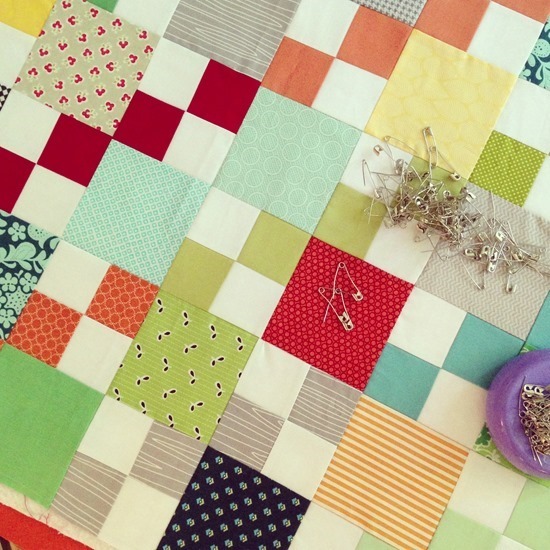 I do not know where I would keep it though, I don't even have a space to quilt yet!!! What an awesome deal on the batting. Our Joann's local will do the online deals as well in the store. lucky/sadly they are less than 5 miles away. I like to go in and just drool. I can not leave there empty handed! I have that Moda Card and it IS huge! I had no idea so many people had chickens! We are in the process of getting a coop/house for about 4 hens. Please show more of what your girls live in! I do the same with my local Joann's but I just bring the roll home from the store. I keep the roll on top of my bookcase in my family room downstairs – they're just so big and bulky and just take up so much room otherwise. So far I haven't conked myself on the head getting the roll down but I have startled the heck out of the cat! I am amazed at the colours on that moda chart, isn't it great, so much nicer than those basic colours of a few years back. Love the chickens Allison!!! And your quilts! I've just received your book (I'm in the UK) and I can't wait to start making the pink houses quilt for my little girl – who is now 21!!! Thought it would look lovely in her bedroom here for when she comes home! Wow would love to buy batting by the roll, but don't have anywhere I could keep it. Yay for Chickens! 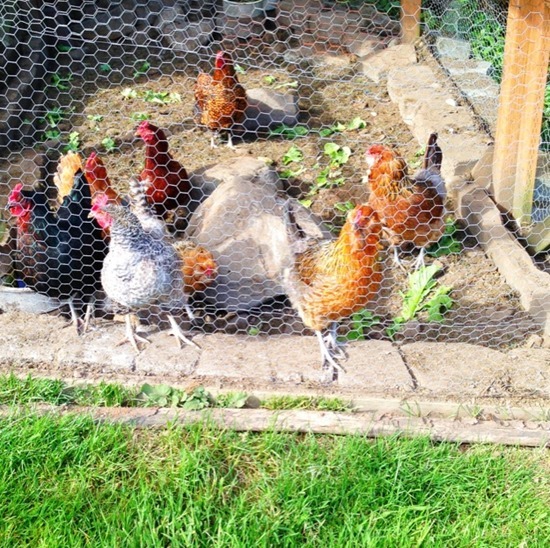 Lovely girls, I have 6 at the moment they live in a fab purple Omlet Cube with walk in run. oh, i keep thinking i will buy a roll of batting. and fyi, my joanns told me if it's half off, they can sell you a roll (if they have it in stock) for that price and then you don't have to wait for free shipping, too. you can just take it from the store… well, with someone to help you load and unload it! I need to get me a roll of that batting too but I have to figure out where I'd put it. You've gotta love those HUGE rolls of batting! How do you store yours? I got a nifty little x-shaped contraption with casters on a and a spindle to stand the roll up on ages ago with a craft-sized roll of Warm & Natural…it was a life saver! 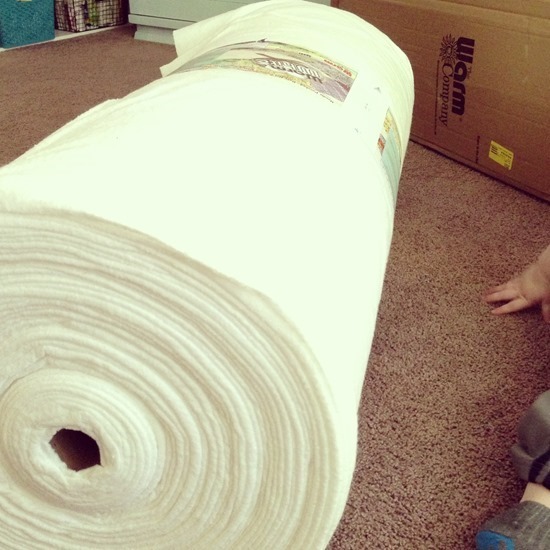 It keeps it vertical and off the floor…IF you can keep the kids from trying to unroll it! You always inspire me with all you accomplish! I love the pictures of the chickens. I am bookmarking this blog post for the next time my husband thinks I have done something crazy. I'll just show him the picture of the roll of batting that you bought. LOL! I've gotten those rolls of batting on sale as well but silly me bought it in person and had to wrangle it into cart, out of cart, into car! What a workout. I love large rolls of batting arriving in the post! What a roll! Clearly, I'm buying batting the wrong way! Love your photos — will see if I can find you on IG!